With its bonanza of organizations offering multiple programs just for us, this town is the perfect place for seniors—women and men alike. 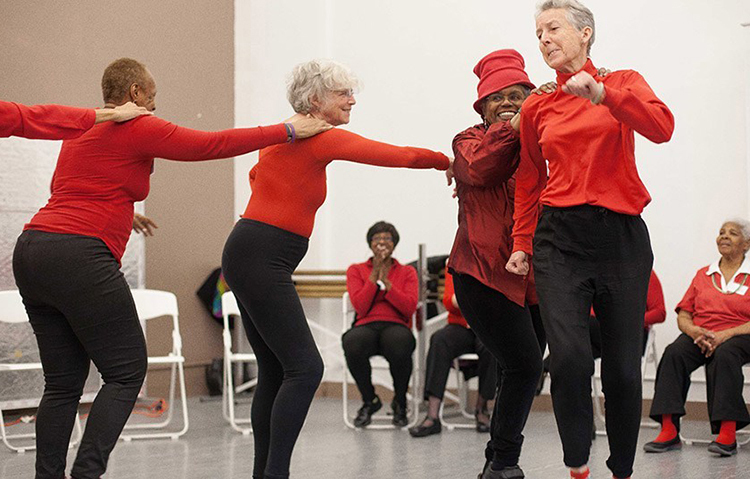 Dancer Naomi Goldberg Haas started Dances for a Variable Population and holds Movement Speaks classes at Senior Planet in Harlem and senior centers around NYC until June. When I signed up for a program sponsored by Coming of Age NYC, I had no idea just how many organizations offer special services to New Yorkers age 50 and older. Yes, I already knew about some of them and had drawn on their resources; but others were entirely new to me. Discovering how many such groups this city offers, I found one more among so many reasons to marvel at how this city is a wonderful place for us to live. Senator Liz Krueger’s Resource Guide: For starters I urge you to get the new edition of the 101-page Senior Resource Guide by New York State Senator Liz Krueger. It is a treasure trove, listing agencies and services that deal with everything from A (Advocacy) to W (What to Do with All That Stuff). Get your free copy of the guide via email, lkrueger@nysenate.gov, or by phone, 212-490-9535; or contact Kreuger’s office: 211 East 43rd St., Suite 1201, New York, NY 10017, and ask for a copy to be mailed to you. ReServe, Inc. matches retirees age 50+ who want to work part-time for a small stipend with public service agencies, non-profits, and a few for-profit organizations. “ReServists” are placed in meaningful assignments, ranging from 10 to 20 hours a week, and receive payment from minimum wage ($15 in New York) to as much as $25/hour. They meet new people, gain skills, provide professional mentorship and enhance the social impact of important community organizations. They may find themselves applying their experience and expertise at organizations that otherwise might not be able to afford such accomplished talent. ReServists come from an array of professional backgrounds, including social work, law, marketing, human resources, health care, education, retail, finance, trade, and military. As of this writing, ReServe has jobs available for an accountant, grant writer and human resource consultant for the Office of the Mayor. If you are computer literate and want to share your skills part-time, go to www.ReServeinc.org and click on the Register as a Professional link. You’ll answer a few questions, watch a PowerPoint presentation and be invited to a group interview. Registration is free and once registered you can search ReServe’s database to explore and apply for current opportunities. To learn more, visit ReServe’s website, call 877-290-6145 or email: info@reserve.org.